Stop by Three-Two-Fun! We are Noblesville's Largest Family Entertainment Center! 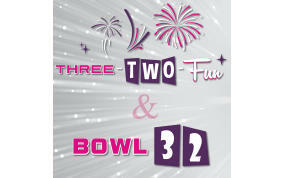 We offer Bowling, Laser Tag, Indoor Glow-In-The-Dark Miniature Golf, Mini-Bowling, The Game Zone, Food, Parties & FUN!! Visit our website for hours and pricing!